Matches are made in heaven but matrimonial websites bring these matches together. A matrimonial website needs to be laced with various visual elements for user-engagement and features for unparalleled experience for those seeking their life partner online. Apart from being user-friendly, attractive, interactive, and engaging, a matrimonial websites also needs to have a clear and intuitive interface for easy browsing of matrimonial profiles and managing one’s own. The web designers at WeblinkIndia are well-versed with the intricacies of designing a matrimonial website and bring various features and functionalities together in their endeavors. Matrimonial Website Development takes into account the needs and preferences of the users including visitors, registered members, website administrators & moderators and staff. For Matrimonial Website Designing and Development, we make use of the advanced technologies to make it an excellent experience for those seeking matchmaking services online. With a perfect blend of looks, interactivity, and usability, our matrimonial web design offers an engaging platform for the prospective brides and grooms to carry out their partner search online. Apart from the traditional and basic search options, our matrimonial web design also offers advanced search options based on caste, location, astrology, etc. 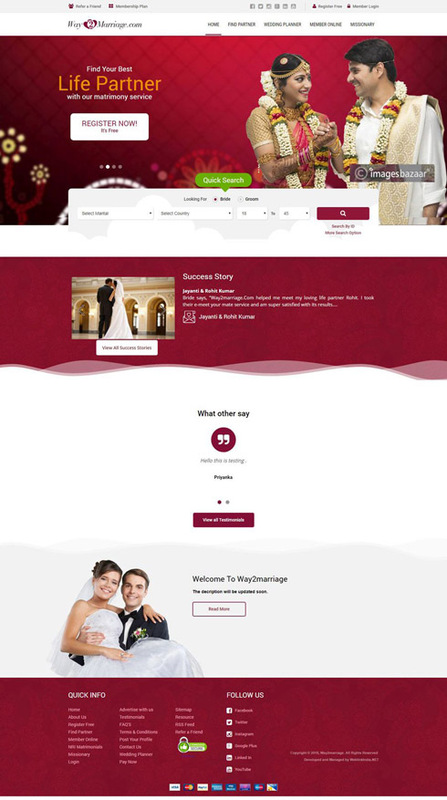 Our Matrimonial web designs come with a 100% secure admin panel. Also, all the personal information shared by the members stays protected within the website. Our team of experts develops a matrimonial website enriched with valuable content, SEO friendly URLs, and rightly placed keywords. The intuitive interface and user-friendly navigation help the users to communicate with interested profiles easily. 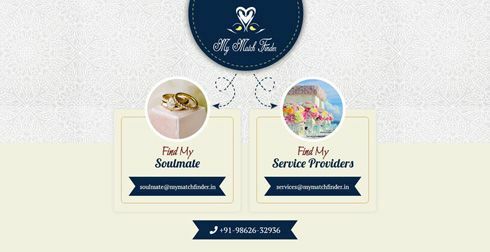 My Match Finder is a Delhi-based based entity engaged in providing a variety of services under one roof. Right from matrimony to photography and caterer to decorator, we provide solution for all. We provide solutions as per the individual’s budget, interests and schedule. In order to maintain transparency in operations, we operate in direct contact with photographer, caterer, dress maker, wedding card maker, etc. To acquire more information about us, visit our official website that is designed and managed by WeblinkIndia.Net. Finding a life partner is a crucial task and by understanding this, we, Gathbandhan shaadipoint presents only ideal matches for both bride and groom. We offer a revolutionary match making service that is based on the fact that we have “to build a happy life through happy marriages”. We offer matches from different religions such as Hindu, Muslim, Sikh, Christian, etc., and from different castes such as Baniya, Punjabi, Brahmin, Jat, Kshatriya, Khatri and others. WeblinkIndia.Net Pvt. 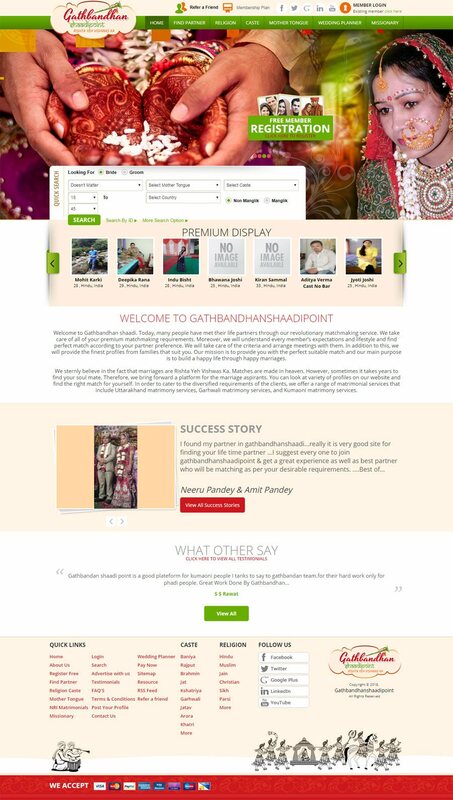 Ltd., a renowned ecommerce development organization has designed the website for Gathbandhan shaadipoint. 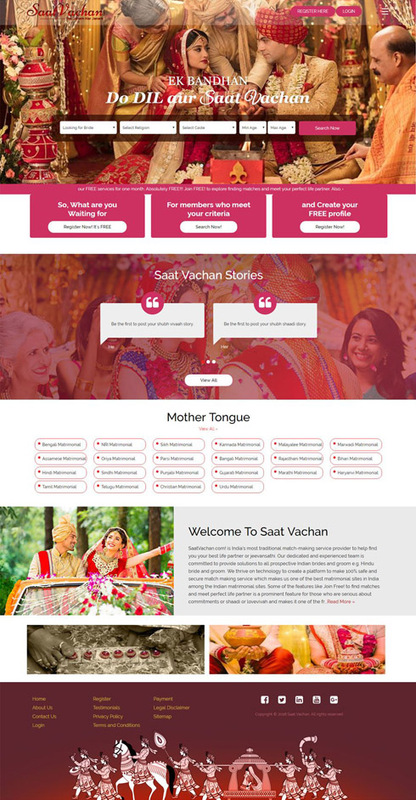 Saat Vachan is a trusted matchmaking service provider that will help you meet your dream life partner. It is the best matrimonial site in India for all the Indian brides and grooms that are looking for the love of their lives. One can easily register on this online matchmaking site and make their profile to start search. They can show interest in different profiles and even start a conversation here. This user-friendly matrimonial website has been designed and developed by WeblinkIndia.Net Pvt. Ltd., one of the top website designing and development companies. Way2marriage is a platform where people can find out their better half. If you want to find a partner of your choice then sign up with us and we provide you the best advice and perfect match. We also have wedding planners with us who can plan your wedding according to your requirements. We accept all types of payment methods including Visa, MasterCard, PayPal, Maestro, and various others. To register with us, visit our website that is developed and managed by WeblinkIndia.Net Pvt. 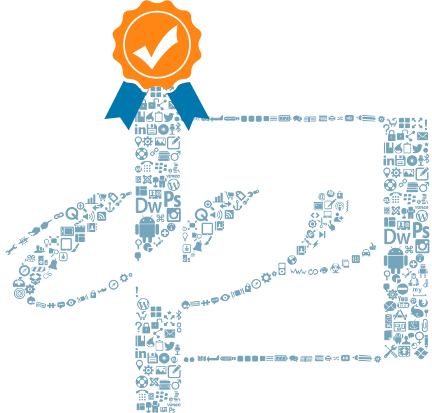 Ltd.
1 We are recognized as a premier Matrimonial Web Development Company, offering services for the development of full-fledged portals with a unique identity. 2 We incorporate innovative technical and creative inputs in Matrimonial Web Designing to assure the best results in terms of convenience, scalability and budget of the users so that the operations can be managed seamlessly. 4 Our team of experts is well-versed with the intricacies of Matrimonial Web Design India and comes up with unique solutions with all the latest functions in Matrimonial Portal for each client. 5 With the integration of such functions along with other marketing tactics, we also ensure that the portals get the maximum web traffic.